Greeley Sq, NYC lies between 32nd and 33rd Streets at the intersection of Broadway and Sixth Avenue and has been operated by the 34th Street Partnership (34SP) since 1992. The 34SP is a Business Improvement District (BID) that oversees over 31 blocks in midtown Manhattan. The 34SP provides sanitary and security services, maintains a horticultural program that includes trees, gardens, and planters, and produces events, product launches, and photo shoots. 34SP also added movable chairs, tables, and umbrellas, to the parks. 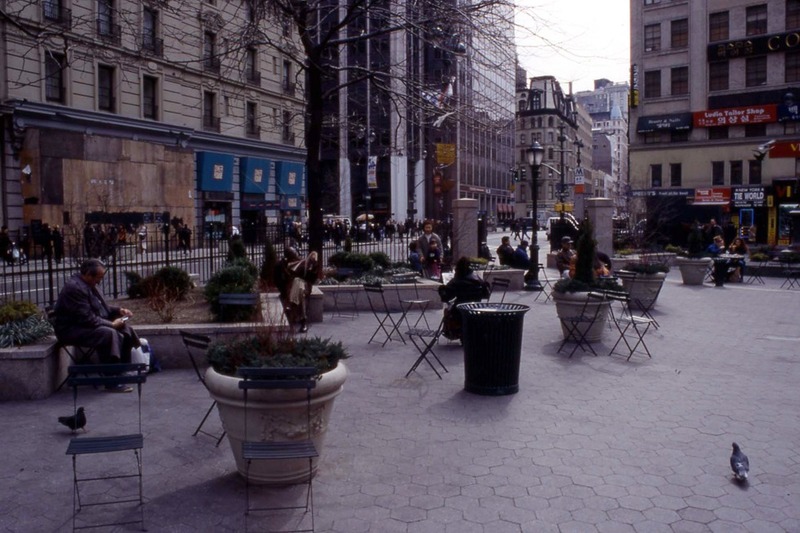 In 1999, the parks were completely renovated by 34SP. The design of Greeley Sq and its adjacent partner Herald Sq have a distinctly Parisian feel, particularly the Paris of one of the greatest gentrifiers - Baron Haussmann commissioned by Napoleon III to instigate a program of planning reforms in Paris during the later half of the 1800s. The old-school and European design language of the squares gives them a sense of permanence - as if they had been there for a couple of centuries. A BID is a defined area within which businesses pay an additional tax or fee in order to fund improvements within the district's boundaries. These include cleaning, security, design and ongoing maintenance. BIDs are a very successful way of privatising public space, spaces that were formerly maintained by the city. The first BID was created in the US in the 1970s. Since then they have been successfully rolled out across the US and in recent years exported to the UK and elsewhere.